Houdini wrote a very nasty book about Robert-Houdin claiming that Robert-Houdin stole many tricks and was in reality not as great a magician as he usually is portraid. Jean Hugard sets with this book the record straight and reveals Houdini's fabricated arguments. Houdini's unmasking of Robert-Houdin was just a revenge on Robert-Houdin's family and had little to do with reality. But you can find out for yourself and read The Unmasking of Robert-Houdin . 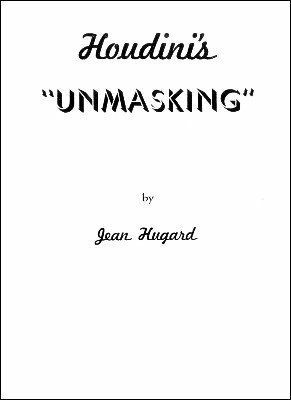 Houdini's Unmasking originally appeared serialized in Jean Hugards magazine Hugard's Magic Monthly . Published as part of "Hugard's Magic Monthly" beginning with volume 15, number 1, June 1957; 78 pages; PDF 48 pages. GENESIS OF HOUDINI'S "THE UNMASKING OF ROBERT-HOUDIN"
Houdini's Indictment No. 7: "According to an article published in 'L'Illusioniste,' scientists to this day, in explaining the law of physics as operated by the use of air-holes in the inexhaustible bottle, refer to it as the 'Robert-Houdin bottle,' when in reality the honor of its invention belongs to some obscure mechanic or magician whose name must remain forever unsung by the writers of magic." Houdini's Indictment No. 8: "All evidence points to the fact that Robert-Houdin merely improved on the tricks employed by Breslaw, Pinetti, and others among his predecessors in magic, by utilizing the newly found assistant to the magician, electricity." Houdini's Indictment No. 9: "But whatever the method employed by Robert-Houdin to secure the effects of 'suspension éthérénne,' he was merely introducing a century-old trick, which other contemporary magicians were also exhibiting ... Robert-Houdin alone was audacious enough to claim the invention as his own." Houdini's Indictment No. 10: That Robert-Houdin did not invent the trick of the disappearing handkerchiefs which he presented at a command performance for Louis Philippe on November, 1846 at the court of St. Cloud, but was indebted for it to the hundreds of humble magicians who preceded him. Houdini's Indictment No. 11: That Robert-Houdin's ignorance of magic was betrayed by his own pen. Houdini's Indictment No. 12: That Robert-Houdin's "Memoirs" were narrow in the extreme.